ProQuest, right now is my best friend. I have been able to find quite a few lovely nuggets on different ancestors in my family tree. This obituary which I found the other day, gave me the names of several female relatives. Laura Ellison, my 3rd great grand aunt, I knew of prior to this. 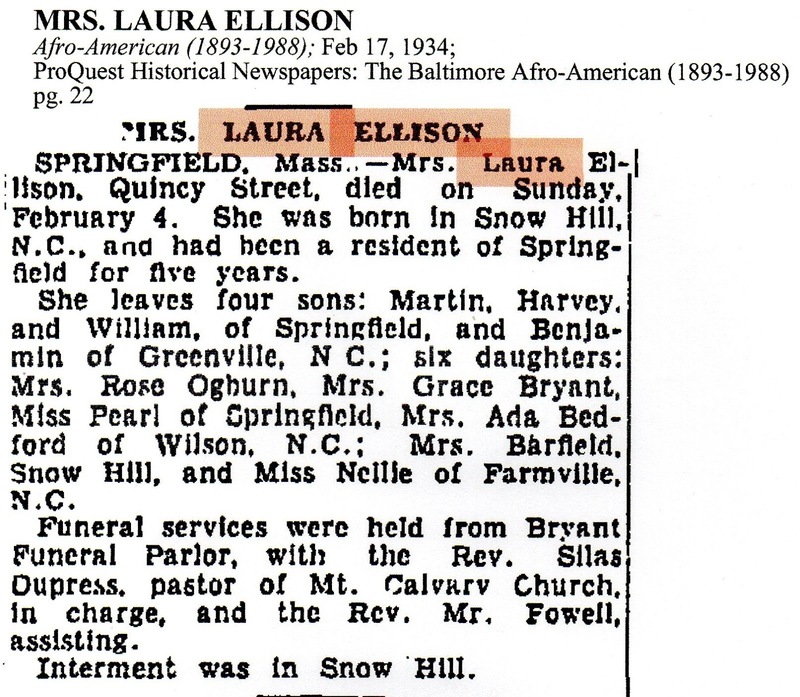 She was born Laura Harper and married my 3rd great grandmother's brother Harvey Ellison. Harvey and his wife were buried at St. Peter Free Will Baptist Church Cemetery in Snow Hill, NC. For pictures of their graves, you can find them shown in my blog post, Why It's Important To Keep Digging. This part of the family came from Snow Hill, NC originally, but later planted roots in Springfield, Massachusetts. 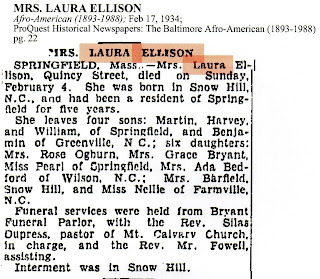 Prior to coming across this article, I had been able to track the whereabouts of two of Laura Ellison's daughters, Mrs. Ada (Ellison) Bedford and Mrs. Gencie (Ellison) Barfield but the others remained a mystery to me. Now, I've got something to work with here! I love ProQuest...Yes I do!!! It is always a thrill to find your family. I know what you mean Yvette, it never gets old. That is so great! You have to take advantage of a free service. In a month you can get a lot of information. That's right, Betty. I am trying to get as much as I can. Andrea, doesn't that make you wish that February had a few more days?!?! Thanks for passing on this info. I am on my way to see what I can find now. Glad I was able to help! Good luck, I hope you find lots. Fold3 has free access to many records this month also.